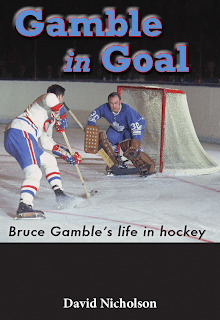 Born in Port Arthur (now Thunder Bay), Bruce Gamble's professional hockey career as a National Hockey League (NHL) goalie spanned 14 years, and he saw action with four NHL teams: New York Rangers, Boston Bruins, Toronto Maple Leafs and Philadelphia Flyers. He is hardly the most famous goalie in hockey history. Yet his story, finally told in David Nicholson's new book Gamble in Goal, is very interesting. Gamble broke into pro hockey in the maskless days of the Original Six. Though he was a solid goalie in the AHL, he never really stuck in the NHL until the late 60's when expansion and the legislated two goalie system saw NHL goaltending jobs grow from 6 to 24. Previously Gamble was best known as the goalie who refused to be subservient to the so called system. He quit hockey in 1965 rather than report to Eddie Shore's team in Springfield. He had had enough of Shore and his irascible ways. So he took 'Shore leave,' quit hockey and went home and worked in the grain elevators back in Port Arthur. It was not until Punch Imlach and the Leafs rescued him a year later that he returned to the ice. Soon enough he was playing with the Leafs, serving as their main goalie for stretches in the late 1960s. Coming off a Stanley Cup dynasty, it was a tough time to be a goalie in Toronto. As the book points out, Gamble goes down as one of the most underrated goalies in team history. "Undoubtedly, Bruce Gamble is an extremely underrated player," said reporter Jim Vipond. "He's got to practically play goal standing on his head before people recognize him." "When Bruce is hot he's the best in the league. But when he lows, he blows sky high," said coach John McLellan. Perhaps reporter of Paul Dulmage summed it up best in the 1969-70 season. "This season he's averaged about 36 shots per game. When he tries to fall asleep the sheep come at him three on one. Without Gamble the Leafs would have sunk so deep Smythe couldn't have found them using Jacques Cousteau." By 1972 Gamble had lost his hot hand and was tending goal for the Philadelphia Flyers. While playing for the Flyers in a game in Vancouver, Gamble suffered a heart attack while playing. It forced him to retire. Gamble mysteriously slipped out of sight soon after that. His marriage fell apart and he kept to himself, moving to the Niagara Falls area. He died of another heart attack in 1982. He was just 44 years old. The book is published by River Rocks Publishing. All in all it was an interesting about a player I really did not know very much about. The book is very thorough in covering his life. Perhaps the text could have been better expanded to cover the Leafs fall from champs to chump during this time period rather than focusing solely on Gamble. 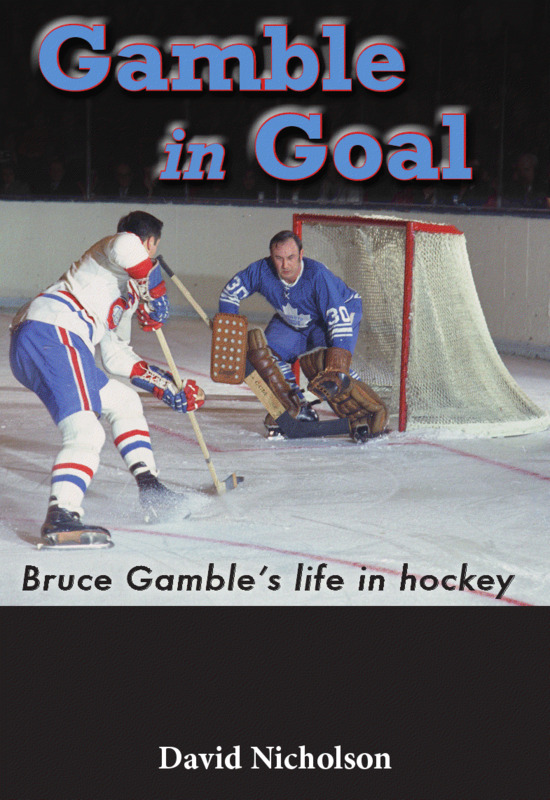 There is no doubt - if you are looking to read up on former Leafs goaltender Bruce Gamble, David Nicholson's book Gamble in Goal is the definitive resource.